The GOLD PRICE burst through resistance with a huge $24.90 (2.21%) bound to close above the breakdown point and the support line from the November and March lows. Mercy, did I mention it punched through its 50 dma like a hot poker through wet cardboard? Yes, it did. 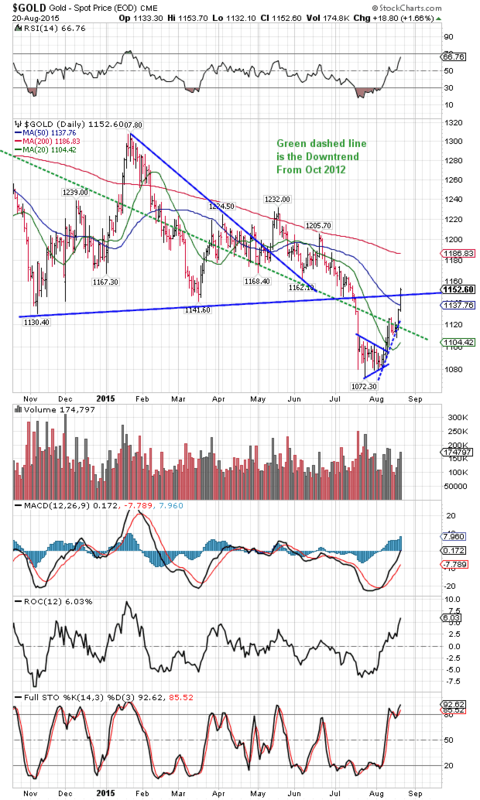 The GOLD PRICE also stands above the downtrend line from the last (October 2012) significant high. From here the gold price needs to move out smartly and conquer that resistance area between $1,180 and $1,200. 200 DMA stands now at $1,186.83, so let’s use that as a first target, with $1,206 next. By the way, this is NOT the end of this gold rally, but just the beginning. You can buy now or wait till it crosses that 200 DMA, but buy you should. SILVER PRICE lagged not behind but led the way, pole-vaulting 34.1 cents (2.25%) to $15.517. Silver, I want to see you close through $15.60 tomorrow and jump toward $16.00. Then set your sights on $16.19 where the 200 DMA is. Whoa! Look at this chart, silver is knocking its head not only against $15.60 resistance, but also the downtrend line from the April 2013 high. Last revenge silver needs to take is closing above that May high at $17.775. Even the white metals are heating up. Platinum jumped another $22.10 today and palladium $13.60. Listen here, this party is just getting started. They ain’t even pulled out the jug yet, and the band’s just warming up. Y’all better get out there and dance. When silver bursts through that resistance, tomorrow likely, it will run, run, run. Something you must all ponder: Will this next financial crisis will follow the path of 2008 or make its own new way? At stake is what currency, which includes not only the scrofulous fiat dollars, euros, and yen, but also silver and gold, will perform best in that crisis. In March 2008 silver hit $20.42 and the price of gold hit $1,003, new highs for the bull market. Then in September struck the financial crisis, taking the dollar index up to 85.67 (up 120% for the year), the Dow down to 7,552 (down 41%), and gold down to $705 (down 30%) and silver down to $8.80 (down 57%). What happened? Pure-dee panic. 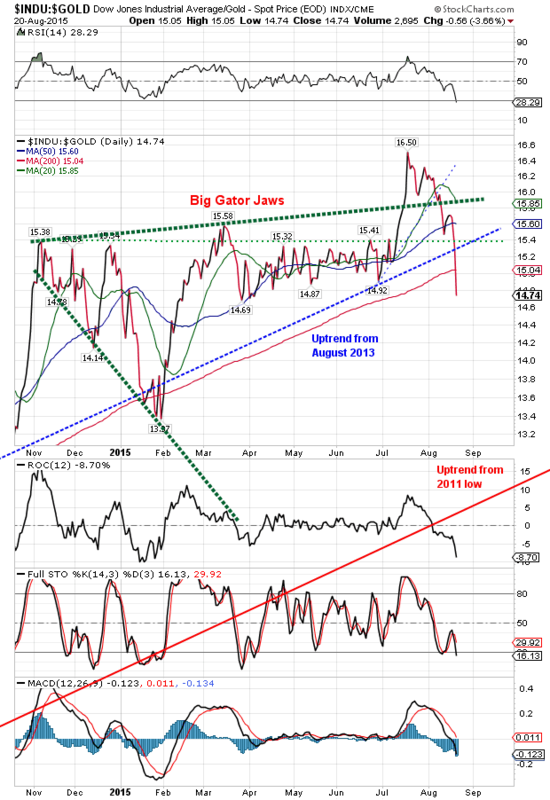 Fear drove people into dollars and US treasuries as the sure safe haven. But wait. What if that doesn’t happen this time? 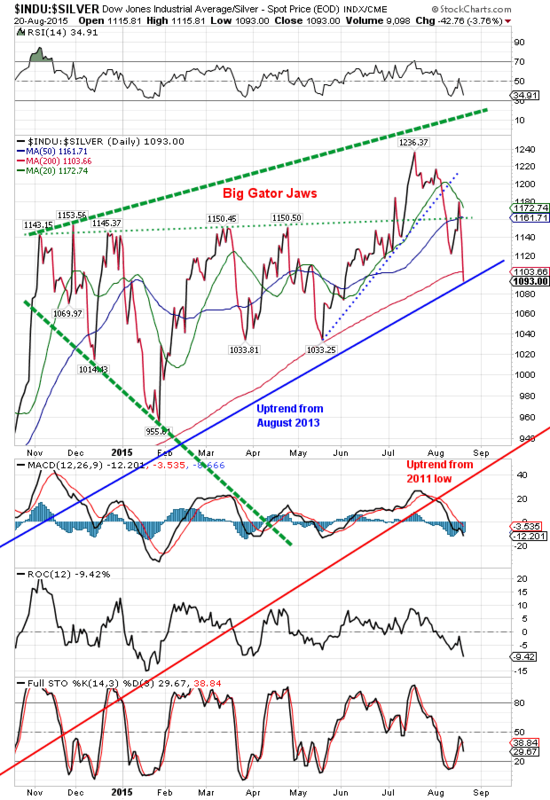 What if the dollar tanks along with stocks, and the safe haven bid hits silver and gold? THAT IS WHAT YOU MUST WATCH. Today stocks tanked around the globe. The Shanghai index is down 8.2% for the week (proving again that governments prop up markets in vain). US stocks sank like sash weights in a cow trough, silver and gold rose, and the US dollar sank. Silver and gold prices even rose IN EUROS, although the euro rose, too. Too early to say what will turn out, but right now fright from stocks is sending the panicked into silver and gold and out of the dollar. 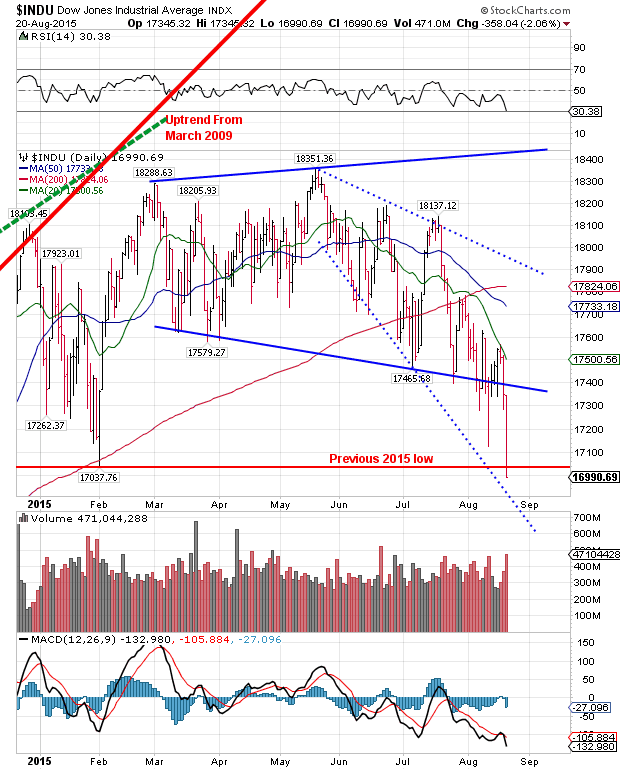 What if the crisis follows the 2008 pattern? Then silver and gold tank with stocks and the dollar flies — for a short time. 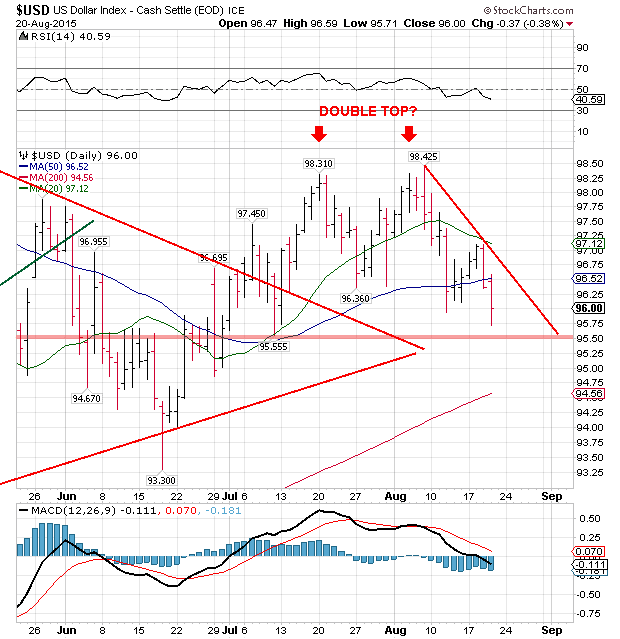 Once the dust clears, silver and gold prices fly and the dollar and stocks sink. All this is why I have been urging y’all to swap stocks for silver and gold. Whichever way the panic turns out, the midlife crisis in silver and gold (the 2011-2015 correction) has ended, and the bull market will outdo everything it did the first 11 years. STOCKS finally gave up the ghost. Dow plunged 358.04 (2.06%) to close at a new low for the year, 16,990.69. S&P500 tumbled 43.88 (2.11%) to 2,035.73, below the March low. Charts on the side. From its 18,312 May high to Dow has lost 7.2%. From the S&P500’s May high it has lost 4.4%. For the year the S&P500 is 1.1% lower, but the Dow is 4.7% lower. 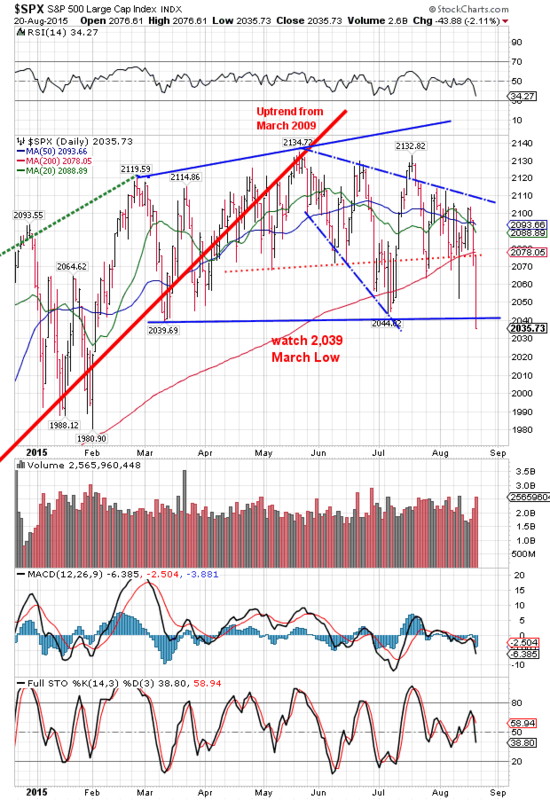 Both indices have fallen through their 200 DMAs. And the fun has only just begun. Listen, y’all, if you NEVER look at my charts you have got to see the Dow in Gold on the right, and the Dow in Silver on the left. This is what I have been looking for, waiting for. The July highs were indeed the final tops and throwovers. Dow in gold today closed at G$304.70 gold dollars (14.74 oz), down G$11.58 today alone. From the 20 July peak at G$341.08 (16.5 oz), the DiG has plunged 10.7%. Ohhh, and silver! Dow in silver has fallen from its 20 July high at S$1,598.54 silver dollars (1,236.37 oz) the Dow in silver has fallen to S$1,413.17 or 11.6%. Today alone it fell another S$55.29. US dollar index slipped 42 basis points (0.44%) to 95.94. Dollar punched its 50 day moving average and never looked back, falling nearly to support at 95.50, the last low. Once it gets past the apex of that triangle, about 95.25, it will speed up. Euro took advantage of the dollar’s discomfiture to rise 1.07% to $1.1240. 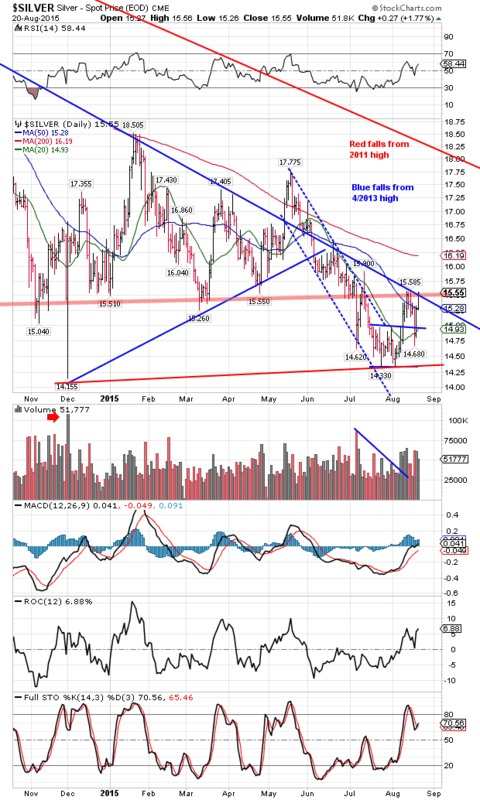 gapped up and now looks ready to rally. Yen has also flown past its 20 and 50 DMAs, and today rose 0.34% to 81.03. I’m gonna hazard the Fed won’t raise interest rates in September, or any time soon. Y’all have a good evening.